When ordering Personalized Plaque please enter name and date. Framed artwork by Mickie Caspi. The seven blessings (Health, Love, Luck, Peace, Success, Joy, Wealth) surround an adorable hamsa in this Girl Blessing print. 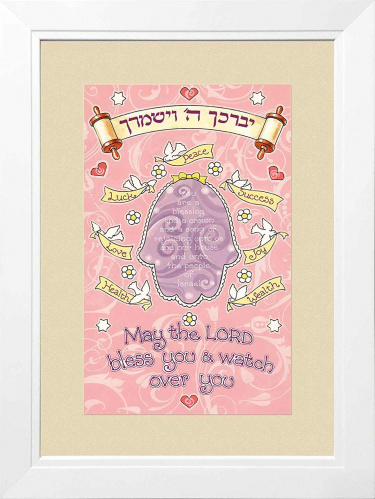 “May the Lord bless you & watch over you” is beautifully written in Hebrew and English. Available with White Frame and Speckled Ecru Mat. Girl Blessing can be personalized with a custom plaque. Measures 11"L x 15"W x 2"D.